Thanksgiving is coming up, which marks the start of the holiday season. Stores are already packed with consumers stocking up on family-favorite ingredients for pecan pie and homemade stuffing. It’s a joyous time of the year, but it’s also a hard time for your waistline and your teeth. Our dentist in Brighton sees an influx of patients dealing with tooth decay, gum disease, and even mouth injuries during the holiday season and knows how Thanksgiving foods and Christmas treats wreak havoc on your teeth and worsen existing gum disease. 1. Sugar-Laden Foods and Beverages Eat Away Your Enamel. Thanksgiving dinner typically involves turkey along with other traditional foods such as pumpkin pie or green bean casserole. Christmas feasts often include many of the same dishes. Eggnog, apple cider, and red wine can be found in most homes during the holidays as well. It’s that time of year when everyone is encouraged to indulge in savory and sweet foods and beverages, but that comes with a hefty price for your teeth and gums. It’s common knowledge that sugary foods and drinks lead to tooth decay, but it’s not the actual sugar that hurts your teeth. The real damage occurs after you’ve eaten that piece of pecan pie. Your mouth is filled with beneficial bacteria that promote good oral health, but some of that bacteria feeds on sugar and transforms it into acids. Those acids live on the shiny surface of your teeth known as enamel. That tooth layer acts as a protective barrier and is also why your teeth have a white sheen. Tooth decay happens when sugar turns to acids which then turns into a bacterial infection that eats a hole in your tooth enamel. If left untreated, tooth decay will reach the deeper layers of your tooth that can lead to sensitivity and pain. In severe cases, you may need a root canal or tooth extraction. 2. Sticky Treats Can Damage Dental Work. Desserts or candies such as peanut brittle, caramel compounds, dried fruit, toffee, and taffy are among the worst of the worst for your teeth. If possible, avoid these foods completely. They dramatically increase your risk of developing tooth decay because they stick to your enamel and between your teeth, making it easy for harmful bacteria to grow. Not only that, sticky treats can damage your teeth by loosening fillings or making previous dental work fall out completely. Porcelain veneers, dental bonding, and other cosmetic or restorative dentistry options are also at risk when you consume these foods. That piece of toffee or caramel may lead to a pricey dental visit after the holidays. 3. Hard Candy Can Chip or Crack Teeth. Your teeth may be hard, but they’re still susceptible to breakage under immense pressure such as biting down on a popcorn kernel or crunchy baguette. Teeth that are already weakened due to existing tooth decay, gum disease, and poor oral hygiene are more likely to be damaged with foods such as almonds, caramel-based candies, and ice cubes. 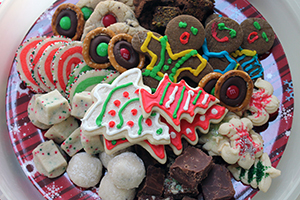 A healthy mouth helps you combat these issues, but you’re still vulnerable to chips and cracks with holiday snacks. These problems worsen if food gets stuck between your teeth. A popcorn kernel, for example, can get lodged underneath your gums or between teeth, leading to an infection, or tooth abscess. Flossing and brushing may help, but antibiotics and emergency dental care are necessary in some cases. If you’ve chipped or cracked a tooth, you need to see an emergency dentist as soon as possible. 4. Using Your Teeth as a Tool May Alter Your Bite. Additionally, using your teeth as a tool can damage your bite and may even lead to a TMJ pain, which can require TMJ treatment or orthodontics. 5. Changes in Routine May Mean Skipping Oral Hygiene. Thanksgiving is the most traveled holiday in the United States and is followed by an influx of traveling for Christmas and New Year’s Eve. If you’re one of the 51 million Americans traveling more than 50 miles this year, you’ll want to double check you brought your toothbrush and floss. Friends and family tend to stay up late playing games and having fun, which means you might be tempted to skip some of your daily dental hygiene habits. Don’t fall prey to that urge as tooth decay can begin overnight. If you do happen to forget your toothbrush and other oral care products, ask the friend or family member you’re staying with if they have an extra or make a quick trip to the closest store. The best way to avoid damaging your oral health is to brush and floss often during Thanksgiving, Christmas, and New Year’s. New research has shown that flossing before brushing gets rid of more plaque buildup and food particles than brushing first. Following up with mouthwash or merely drinking plenty of water reduces your odds of developing cavities and gum disease. Our dentist at Bromley Park Dental recommends flossing and brushing your teeth three times a day during the holiday season and drinking plenty of water to wash away food particles. We also recommend brushing and flossing about 30 minutes after eating, especially for Thanksgiving. The less time your tooth enamel is exposed to sugary or acidic foods the better. Remember to check your gums for sensitivity and inflammation as gum disease can worsen dramatically over the holidays. A teeth cleaning and dental exam before and after the holiday season is a great way to prevent and get rid of all the residual buildup from Thanksgiving and Christmas foods and drinks. Schedule your appointment with our dentist in Brighton today at (303) 558-6537. Bromley Park Dental serves patients in the Brighton, Colorado area including Thornton, Commerce City, and Fort Lupton.